Literalists find easy pickings in Manet's Skating because, as a performance in public of a newly popular sport, it cries out for a social interpretation.1 Those who read the scene as though it is illustration, however, are rarely on the right track because art seldom illustrates an aspect of the exterior world or even an event in a literary narrative. When illustration was desired by the patron as in a portrait, artists would then undermine the scene by intentionally leaving clues to what they were really depicting, some aspect of their inner being. We will find these clues in Skating as well but let's start with Manet's story about the picture. Most of his own reported commentary (there is not much) misleads but, like his paintings, can sometimes be read through the lines by those aware of his principal intentions. Lord Leighton, a fashionable English artist of the day, appeared in Manet's studio when Skating was on his easel. "That's very good but don't you think, Monsieur Manet, that the dancing figure and the contours of the figures are not sufficiently arrested?" Yet no-one has noticed that the figure on the right (here, top right) might be an artist. She looks over her shoulder which I explain elsewhere is a painter's iconic pose.4 Manet's first biographer noted the importance of this figure and a later scholar recognized a compositional resemblance between The Skater and Manet's Mlle V ..... (1862), a painting we now know is about art.5 Viewers have still never imagined that the unidentified skater looking over her shoulder is Berthe Morisot, as the comparisons at left suggest. 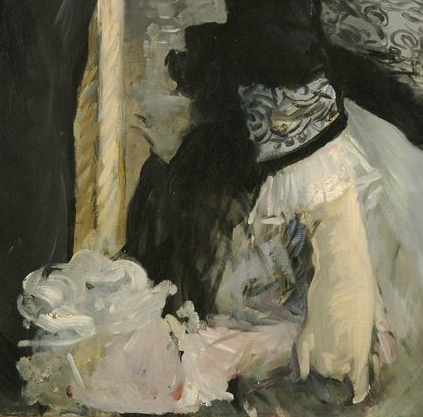 L: Detail of Manet's Skating. 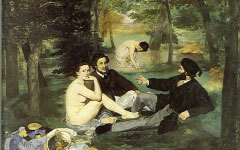 The principal woman also has reddish blond hair like Manet's. At far left a man in a top hat, yet another of Manet's public attributes, conceals a skating woman whose hand, fingers splayed, emerges from his back9. 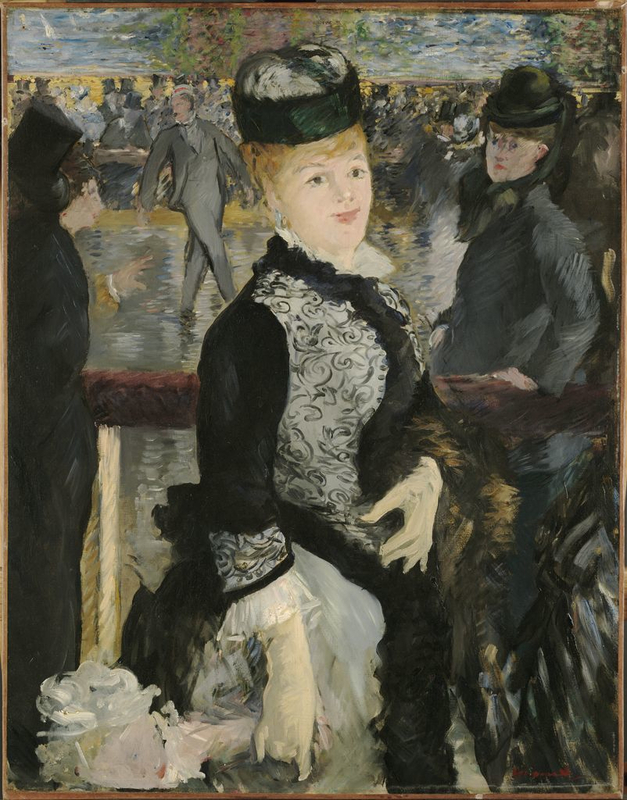 Her hand spells M for Manet as does the torso and arms of the male skater she "paints." As half of an androgynous duo, the woman's hand also prepares itself for a fall, thereby representing the risk involved in great art and the fear of failing on a public stage.10 Besides, an iced pond is a natural symbol. A body of still water commonly symbolizes the reflective surface of a mind. Yet when frozen, skaters - like painters in their studios - draw lines in it. In Skating, painted six years before his death, Manet can be seen working his way towards the beauty and concision of his last, great masterpiece, A Bar at the Folies-Bérgère (1882-3). 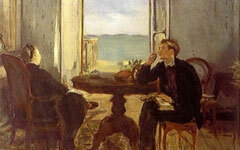 The man in the top hat at the edge, Manet himself, will appear again behind a large figure facing outwards. Here, playing on self-representation and the androgyny of the creative mind, Manet depicts himself as a "painting" of a female skater, her jacket decorated with a motif of scrolling ivy to suggest his understanding of nature and its eternal life. 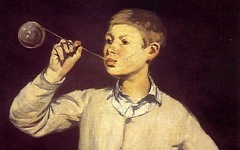 Manet alone is not responsible for his art; nature works through him. As a female skater, Manet draws lines on the surface of his androgynous mind11. Berthe Morisot appears as both artist and model, the sketchy background an imitation perhaps of her own style of painting. Identifying with Morisot as a female artist and the other half of his androgynous mind, Manet made a similar poem out of Before the Mirror. Even the child recalls the "artist" as a young girl in Railway (1873), her arm also extended to "paint". With at least five "artists" in the composition, all representing Manet in one way or another, it is difficult to know who is exactly painting who. Skating, while not as eloquent or articulate as his better-known masterpieces, still helps explain them. 3. ibid., pp. 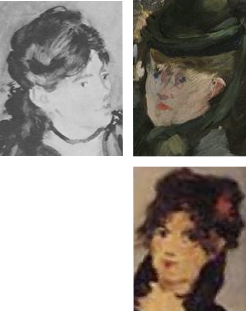 14-15; The year before Skating, in 1876, Manet had painted Before the Mirror which I have already shown is an allegory on art using Berthe Morisot and her style of painting as its central feature. In 1873 he used one of her watercolors as his inspiration for The Railway. As a female artist she was a useful metaphor for the androgyny of his own creative mind. 6. Carol Armstrong, Manet Manette (Yale University Press) 2002, p. 308; The yellow gloves appear in paintings throughout his career including On the Balcony (1868), In the Conservatory (1878-9) and A Bar at the Folies-Bérgère (1882-3). 7. For more examples of extended thumbs indicating palette-hands, see Courbet's The Wounded Man and other entries under the theme Brush and Palette. Michael Fried first identified the meaning of a thumb separated from the other fingers while writing on Courbet. 8. Great artists have often represented themselves as a small child, even the infant Christ, to symbolize how they have entered the divine realm, newly born. And ever since the Middle Ages they have positioned themselves under their work, so to speak, on a smaller scale stretching upwards to paint it. Titian represented himself on several occasions "painting" on his knees while looking upwards, starting as Mary Magdalene in Noli Me Tangere and ending as Nicodemus in his late Pietà intended for his own tomb. 9. 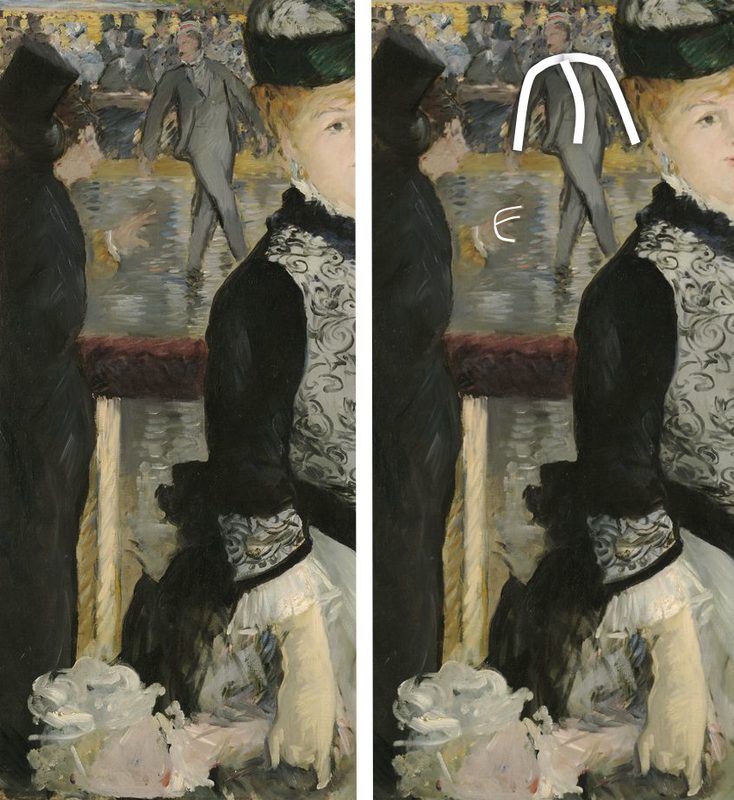 The man in the top hat recalls the male figure in Manet's later A Bar at the Folies-Bergérè (1882-3), here present for the same reason, as a hidden representation of the artist. Artists often depict themselves at the extreme edges of a painting, as Manet himself did with a real self-portrait in Music in the Tuileries (1861-2). 10. Picasso's acrobat perched on a large, unstable ball, hands outstretched, conveys similar meaning. 11. The idea that the female skater is an "artist" who draws lines is possibly a very subtle challenge to the conventions of the time. In the mid-nineteenth century Ingres and his many followers considered line a masculine approach to art as compared to Delacroix whose use of color to create form was considered feminine. Original Publication Date on EPPH: 27 Jul 2012. © Simon Abrahams. Articles on this site are the copyright of Simon Abrahams. To use copyrighted material in print or other media for purposes beyond 'fair use', you must obtain permission from the copyright owner. Websites may link to this page without permission (please do) but may not reproduce the material on their own site without crediting Simon Abrahams and EPPH.